Our discount grocer featured 10 pounds of uncooked chicken tenderloins, lightly breaded, for $11.99 this week. The manager said they occasionally order 3 or 4 thousand pounds of these directly from Perdue, reassuring me that they were not "salvaged" from anywhere. This is less than I can buy raw chicken at the grocer, although here part of the weight is in breading. The entire box contained 110 individual tenders of varying sizes. I put ten in each freezer bag. This works out to approximately 10 cents per piece. 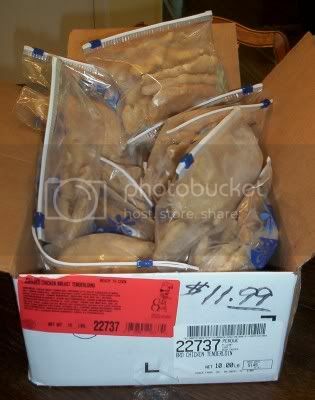 Considering my only effort was repackaging, I think this was a good price for kid-friendly, boneless chicken tenders, ready to cook. Some pieces are thin and broad enough to use in recipes that call for chicken cutlets, like parmiagana. Wow, my son would be thrilled if I found a deal like that. Great job!! Our UFO grocery (United Food Outlet NOT Unidentifed Food Objects LOL) has a deal like that. Wonder if the chicken comes from the same place. Where did you get the chicken, by the way? I've driven past it on Nolensville, although I have never been there. The family that owns it is supposedly very, very distantly related to my husband's dad's family. Ladies, it's pretty sad that you're all so excited about getting a deal on the nutritional equivalent of mudpies. (mudpies are probably healthier) What do you think the long term effect of all those serving of salt, fat, and chemicals will have on your kids? The money you saved today, they'll spend on healthcare later.